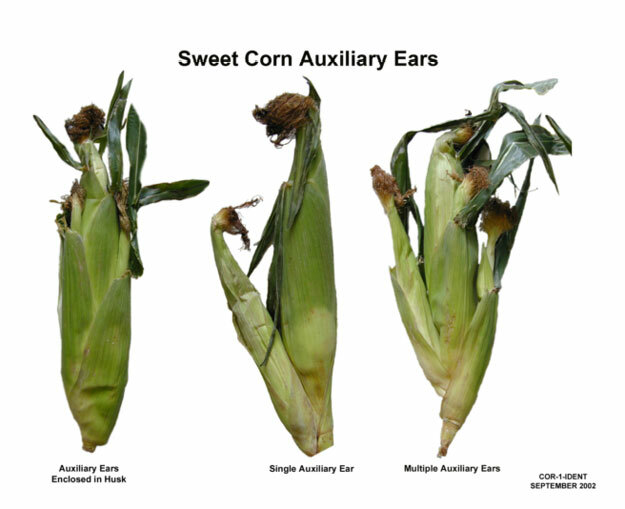 Were you wondering what the defect “Auxiliary Ears” is? When inspecting sweet corn, either white, yellow, or bi-color corn, you may come across an ear of corn that has an extra ear attached. Many times these tag-alongs will not be fully developed ears, but will be smaller in size than the regular ears and the kernels will not be developed. and the ear on the right (multiple auxiliary ears) would be scored as serious damage. Let me hear from you, if you agree or disagree with this guideline. Why would the USDA spend the time to make a visual aid and not even assign scoring criteria to it? What good does it do anyone? What is also missing is a definition of damage. I’d say the closer the aux ear is to the main ear, the more chance for damage by growing too near the main ear. Therefore, the left example would promote more damage than the center or right examples, where the aux ear is clearly separate from the main one.